This current series of articles could be summarized as a review of ways to construct and diversify a common stock portfolio. In part 1 found here I discussed various viewpoints on how many stocks a portfolio should hold. In Part 2A found here I presented and discussed Peter Lynch’s 6 general categories of stocks. In this part 2B I will continue reviewing diversification strategies by evaluating the potential benefits of portfolio construction across the 11 sectors. One of the most common refrains I share with readers is: “it is a market of stocks not a stock market.” I so adamantly repeat this because I feel that too many investors think of investments in terms that are far too general. My favorite (or more honestly stated my least favorite) example is how often I am asked what I think the market will do? My response is always the same, I have no clue or idea what the market will do in the short run. However, this answer is usually met with consternation at worst and/or confusion at best. I guess people feel that because I am a registered investment advisor, I should have an opinion of what the market will do. However, from my perspective, the answer to that question has too many variables that would have to be evaluated simultaneously. In other words, the question is too complex. Therefore, I believe it is an impossible question to answer. On the other hand, if you ask me what the individual holdings in my portfolio will do, I feel I possess a reasonable ability to correctly answer that question. However, I would qualify that by stating that I have no idea what the price of my individual holdings might do in the short run. Instead, I feel I have a reasonable idea of how the businesses might perform over the long run. As a result, and from that perspective, I am willing to make an educated guess on what the price of my individual stocks might do over the long run, as well as the prospects for dividend income – if any. For further clarification, my view of what the price of my individual stock might do over the long run will include a consideration of its current valuation relative to my expectations of operating results going forward. My point is simple, and I hope obvious to the reader. It is far easier to analyze an individual stock based on its past, present and future fundamentals and values than it is to attempt to guess what a fickle stock market might do in the short run. But even more to the point, my opinions are always long run in nature. After more than four decades of analyzing and investing in stocks, I have learned to accept the unpredictable nature and reality of short-term stock price movements in an auction stock market. Furthermore, and getting back to the subject of diversification, the nature and attributes of the individual stocks that I own or manage are more pertinent to me than a sector or subsector designation they carry. Just like people, common stocks are unique, and therefore, I believe should be judged based on their specific merits. Nevertheless, I can understand and even support the idea of diversifying a stock portfolio across several sectors and/or subsectors. 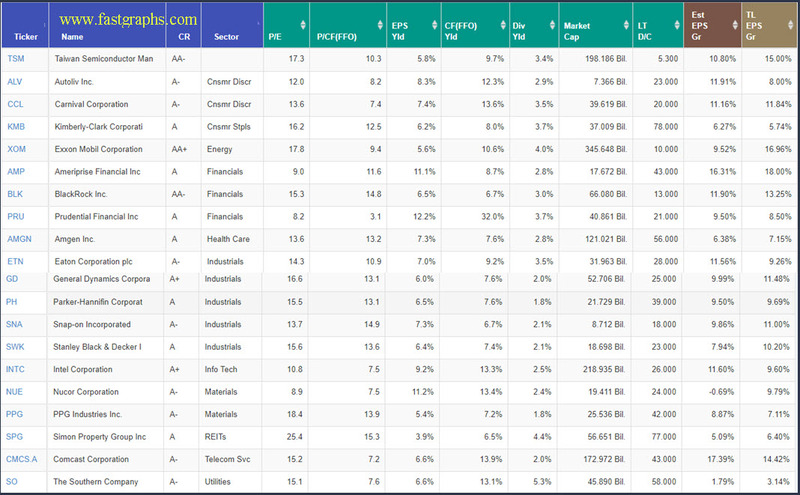 Consequently, and as promised, I recently ran screens looking for high quality (companies rated A- or better) reasonably valued dividend growth stocks in each of the 11 sectors. This has proven to be a challenge considering how late we are in this long-running bull market. However, I did find 19 high-quality dividend growth stock research candidates that could be considered for constructing a total-return-focused dividend growth portfolio. In addition to high quality, I was also looking for consistent historical operating results, attractive valuations and above-average prospects for future growth. But, my goal was to include at least one company from each of the 11 major sectors. Although I was able to find companies in 10 of the 11 sectors that met all my criteria, I was unable to find anything in the Materials Sector. Nevertheless, I did include the Dividend Aristocrat Nucor Corporation (NUE) based on its A- rating, aristocrat status and low valuation. However, Nucor Corporation did not meet my criteria for consistent and reliable historical or future growth potential. Consequently, I only included it in the following portfolio review because I feel it supports the concept of a market of stocks. In closing, I would like to emphasize that my approach and preference for diversification strategies are always long-term oriented. When I invest in a stock, my preferred objective is to consider it a permanent long-term holding. Consequently, I am rarely concerned about short-term stock price performance. Instead, I tend to focus on the business and I attempt to do it in a very pragmatic way. For example, from my perspective I only get real information four times a year when companies report their operating results. Moreover, I am not interested if they beat or miss earnings estimates by a few cents and the short-term stock reaction that often occurs. Instead, my more practical approach is to determine whether (or not) the company is more (or less) continuing to grow in line with my expectations and needed results. Although I found the information fascinating and rational as presented, it was a little too short-term oriented for my taste. However, some of you may find it worth the read. Finally, one of the primary goals of this series has been to illustrate that there are numerous strategies, methodologies and realistic ways to diversify a stock portfolio. As I stated in my first article, there is no one perfect strategy – nor is there a one-size-fits-all. At the end of the day, investors need to build and design their portfolios to their own goals, objectives, risk tolerances and needs. With this segment I focused on a strategy of identifying high-quality dividend growth stocks for a total return objective. In part 3, I will turn my focus to dividend growth stocks with a higher current yield. In other words, building a diversified portfolio of fairly-valued dividend growth stocks for a current and growing dividend income stream. This entry was posted in Research Articles and tagged ALV, AMGN, BLK, CMCS.A, dividends, FASTgraphs, growth, Industrials, INTC, KMB, Materials, PH, PPG, REITs, SO, SPG, utility, XOM. Bookmark the permalink. ← Did IBM Buy Red Hat at a Fair Price? Great information … keep it coming. I personally go for more yield , but they’re not rated as good as your picks . How much weight should I give rating ? Mark: good question. For example, Schwab rates GD as D. Here, it is rated A+. So, in addition to your question, how does one know which rating has more credibility?